Hey peaches! I'm going to make this short and sweet. I just realized that I haven't done any watercoloring in a while! I know! For those who are regular followers, you know that's totally not like me. I’m not even sure why. Perhaps I’ve been occupied by all of the new yummy ink colors and stamps or maybe I’ve been enjoying other techniques. In any event, I’m happy to report that I’m back with a watercolor wonder to share. 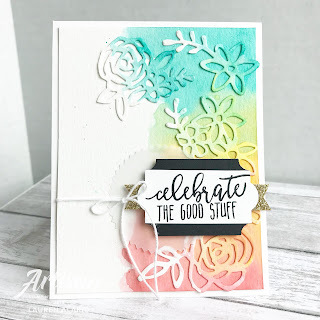 Today, I’m featuring the Picture Perfect Birthday Stamp Set and the Springtime Impressions Thinlits. I was inspired by these lovely water colors and flowers (picture below). I love the look of the soft colors and anything rainbow makes me happy. I began by taking a panel of Watercolor Paper and created a rainbow background with my inks. 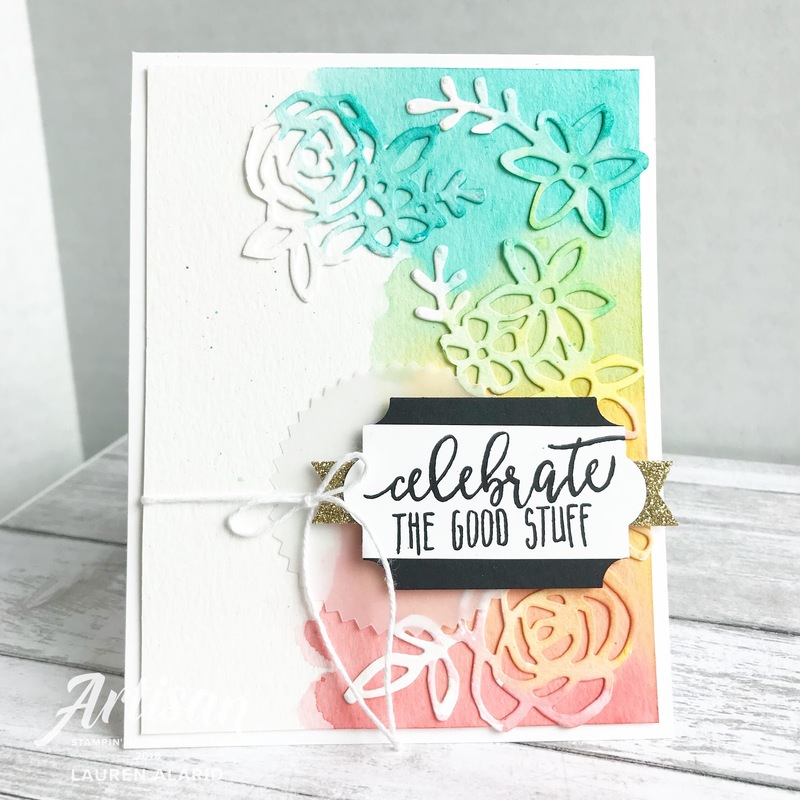 I used Bermuda Bay, Flirty Flamingo (returning In Color), and the brand new Pineapple Punch Inks. I used my Aqua Painter to create a rainbow watercolor washed background and made sure to mix colors in between, Bermuda mixed with Pineapple, Pineapple mixed with Flamingo, etc. I put that aside to dry. While that was drying, I die cut out some flowers, using the Springtime Dies from Watercolor Paper. Then I used the same ink colors to color my flowers in a messy fashion. When the watercoloring was all dry, I adhered the flowers to my background and added my sentiment. That finished off my card for today. Thanks so much for stopping by and I’ll see you next post! 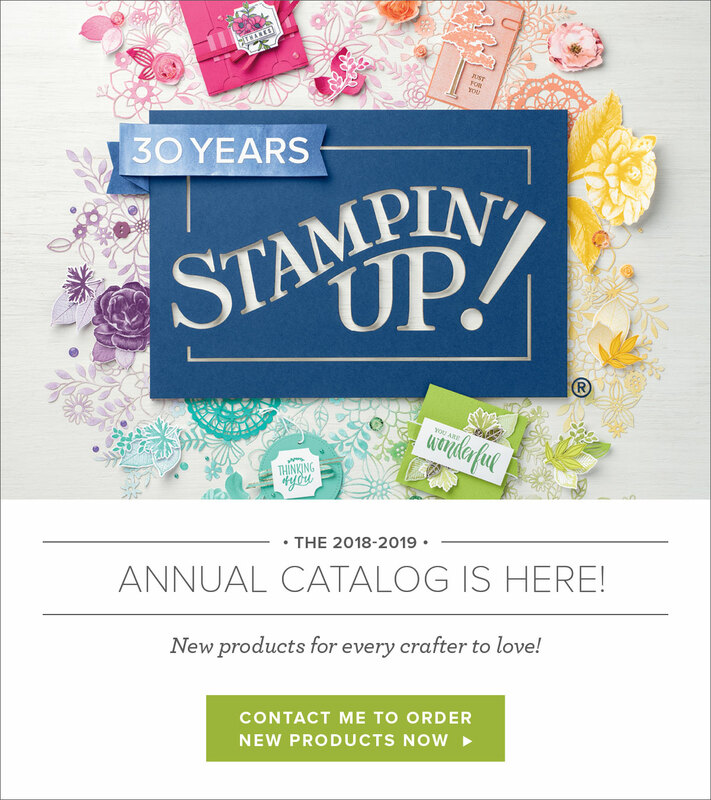 Get your friends together and host a party to earn Stampin' rewards! Contact me to book an event! Hey peaches! I'm back again with a really fun card today. I using an oldie, but goody set, Flourishing Phrases and coordinating Flourish Thinlits Dies. I have always loved this set and find myself returning to it often. 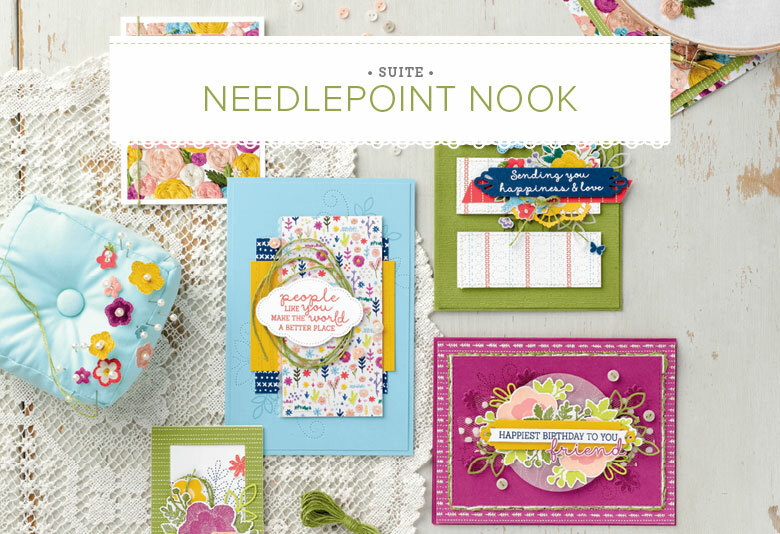 Because it has so many beautiful floral images and sentiments, there are so many ways you can use it. 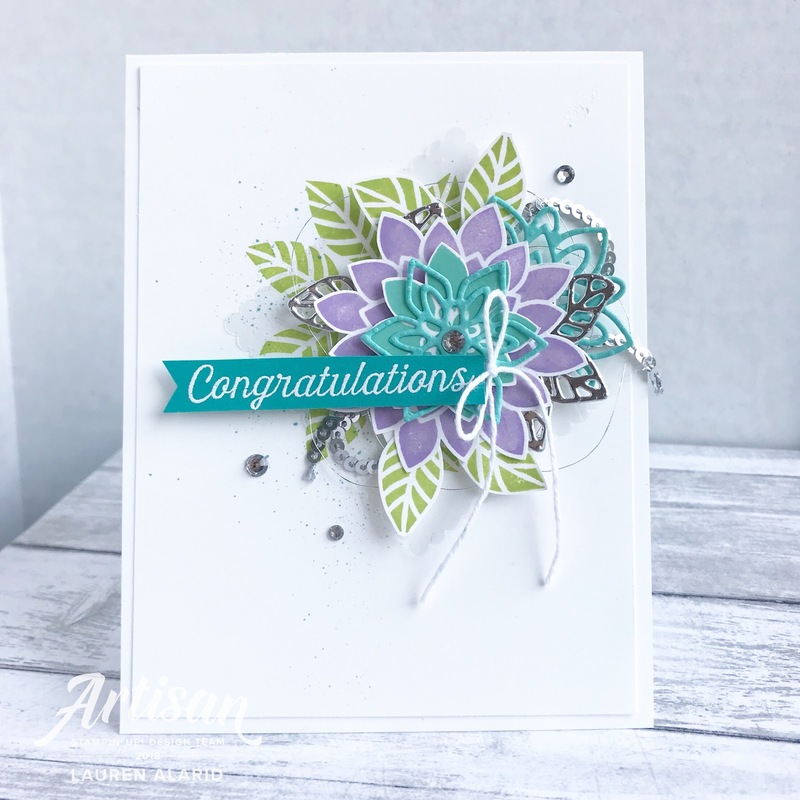 This time I have created a congrats card. I started by stamping the base with the double leaf image in Lemon Lime Twist Ink in a circular fashion. I stamped a few additional leaves and cut them out so I could layer them on top for added dimension. Then I stamped the largest floral image in the brand new Highland Heather Ink, and let me tell you, this soft lavender color is gorgeous! 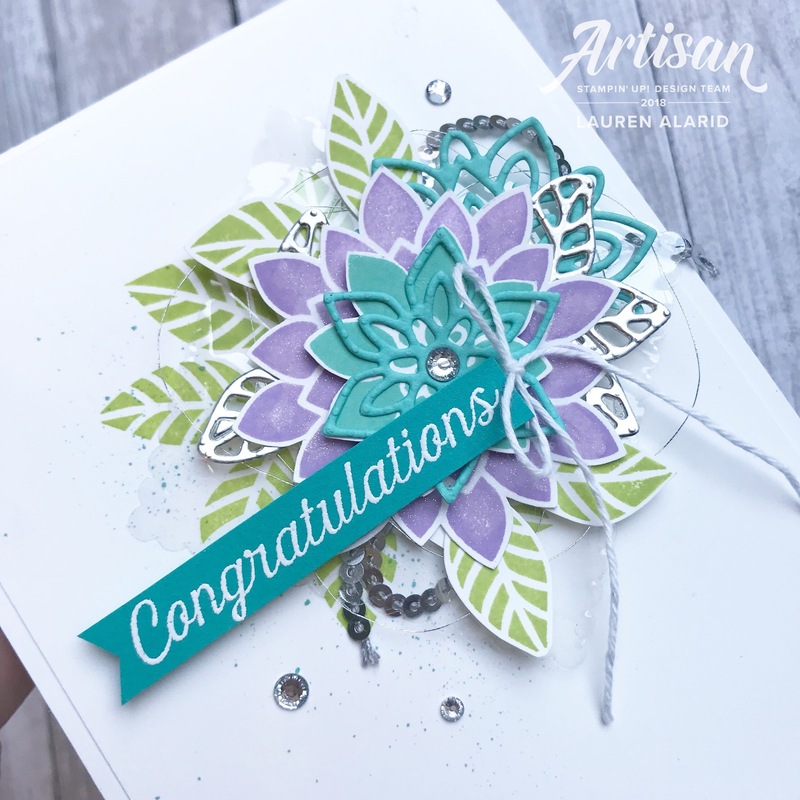 I also stamped this larger flower in Coastal Cabana (my personal favorite) and cut the center of the flower out to layer on top of the Heather one. To finish off the details of my card, I added some Silver Sequin Trim and and Rhinestone Basic Jewels. Thanks so much for stopping by! See you next post! This month we are looking to the True Gentlemen Suite of products for inspiration. With Father's Day right around the corner, this magnificently masculine themed suite seemed the apt choice. This suite has so much to offer and is a classy way to honor those stand up men in our lives. Now for my card, I used this suite and the colors as my inspiration. This suite features deep green and blue tones in Tranquil Tide and Night of Navy, so naturally I took that color scheme and ran with it. 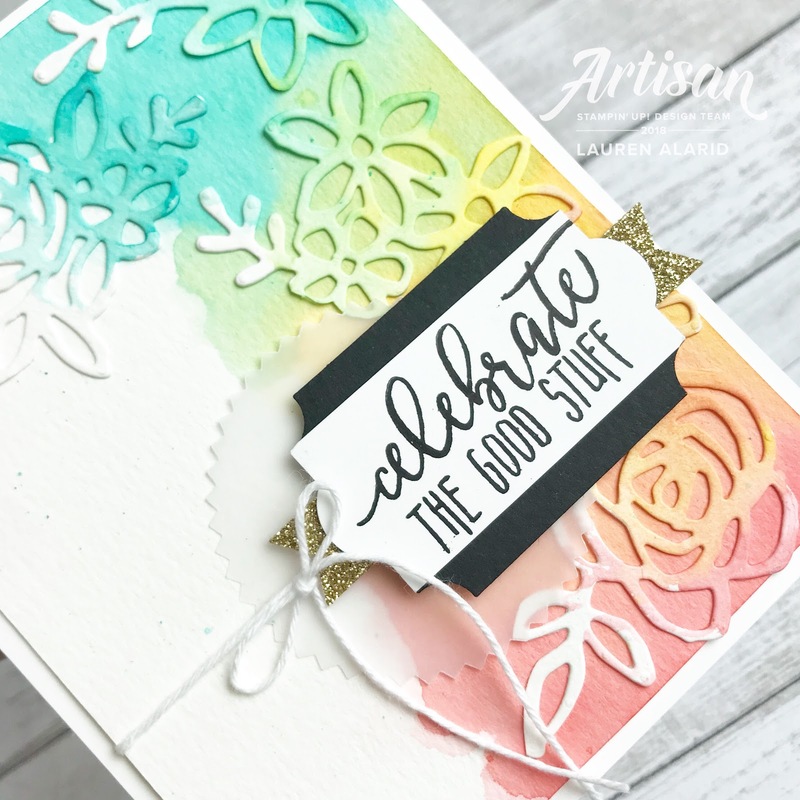 The watercolor patterned background was created by stamping the "plus sign-looking" stamp from the Picture Perfect Birthday Stamp Set in Night of Navy Ink onto Watercolor Paper. Because this set is photopolymer, it is very easy to line them up and stamp in a pattern repeatedly. I wouldn't worry too much about ensuring perfect spacing as this pattern is very forgiving an allows for small imperfections. 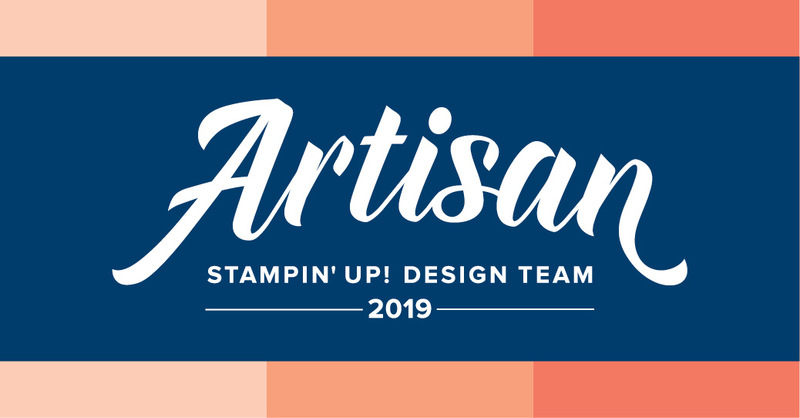 After covering the watercolor paper in this pattern, I used my Aqua Painter and just the plain water in the barrel to draw color from the stamped images in Navy. This ink is water based so it will run when in contact with water. If you want a more intense colored background, you could dip your Aqua Painter in Navy Ink and add more color. However, I wanted a more subtle background so I did not add any additional ink. I added some Tranquil Tide Cardstock and Night of Navy Cardstock, using the Stitched Shapes Dies and the Best Badge Punch to build up some additional layers and texture and then finished off my card with a few embellishments. I added a few sequins from the Metallic Sequin Assortment and some Silver Metallic Thread and that basically finished off my card. I hope You have enjoyed my card for today and don't forget to keep hopping for more inspiration. Up next on the hop is the lovely and talented Cindy Schuster. Hello peaches! I'm here to share with you an fun ink blended background card. I don't do these cards enough, you guys! There are so many ways to create; it's easy to forget some techniques, but easier still to return to them. Ink blending is a really fun technique and you can get so many different looks from it. Typically, I prefer a softer ink color for blending, but I'm not afraid of working with the bright ones either. It just depends on what look you're going for. 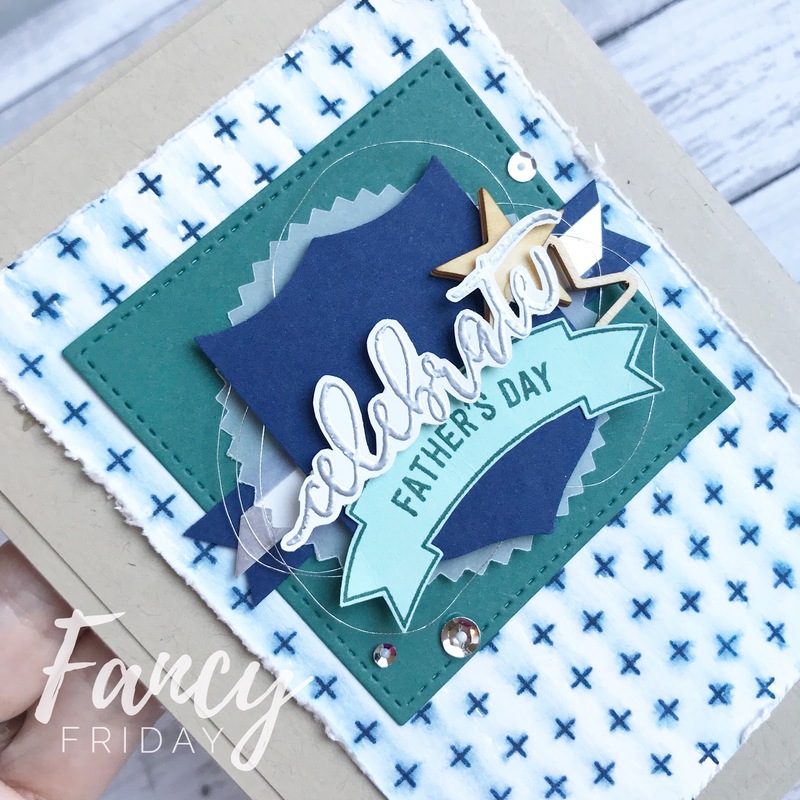 In today's card, I wanted the blended background to be subtle and understated because I wanted the focal point on my main images. I am featuring the Sea Of Textures Bundle for this card. 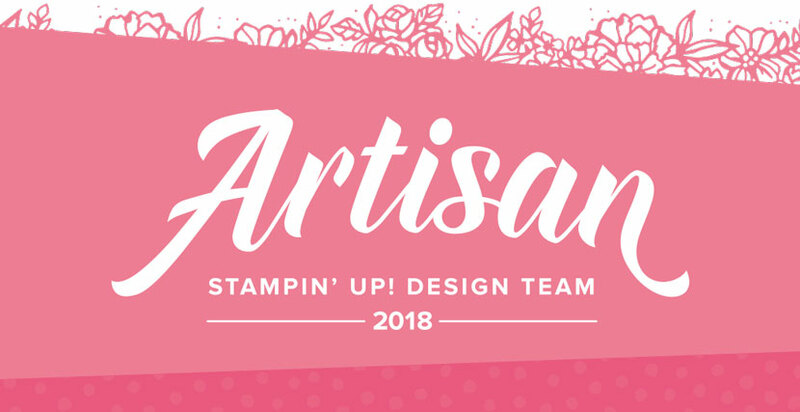 This set has such great images to stamp as well as coordinating dies to cut with (Just a note: this set will be available to customers on June 1st). One of the most unique things about this bundle is that it has dies that are stand alone, or don't match up with any of the stamps in the set directly. I love when there are dies like this is a set because it offers so much versatility with the set. With all of this in mind, I wanted to highlight a few die images that are not only stand alone, but may not be used as much as the main octopus image. I began with a panel piece from Whisper White Cardstock. I used my Stampin' Sponge to lightly sponge on my Soft Sea Foam Ink. Now the key to ink blending, in my humble opinion, is two-fold. First, as you ink up your sponge in ink you'll want to dab off onto scratch paper before applying to your project. This will help minimize any unintended harsh marks of ink. The other strategy is to start light and slowly build up the color. Remember, you can always add more color, but it's difficult to remove take it away. I like to start at the edge og my panel and work my way in to the center, depending on where I plan to have my ink blending. After ink blending my background, I used my Mint Macaron Ink to, first stamp off, then stamp a few textured stamp images from the set. 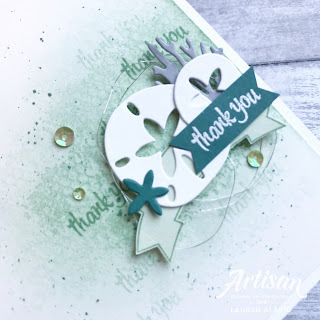 Then in both full strength and second generation Mint ink, I stamped the "thank you" sentiment from the Thoughtful Banners Stamp Set in my background randomly. I use this same sentiment for my greeting that is stamped on Tranquil Tide Cardstock. Next I cut out the sandollar images from the set. Then to finish off my card, I added some Silver Metallic Thread and a few sequins from the Iridescent Sequin Assortment.